LARGE minority is a fresh travel movement dedicated to creating meaningful travel adventures. Our inimitable experiences are quite simply the ultimate road-tripping journey. Looking for something different? a hands-on adventure capable of tickling you right there where it really counts. Well, we want to take you on a unique road trip beyond your comfort zone. We’ve made it our personal mission to pack our journeys with as many unforgettable and authentic experiences as you can imagine. In Asia, we lay on the organized chaos of auto-rickshaw challenges around spicy Sri Lanka and spectacular Cambodia. Each is a three-wheeled test of your character, resourcefulness and skills. In South America, discover epic Colombia by canoeing along the mighty Amazon, cycling through the pristine jungle into Brazil, clattering through colonial towns by jeep and exploring coffee country on horseback. We believe that escapades are like life - you take out what you put in. So, all our journeys are mentally and physically challenging, and you’ll come away with a real and meaningful experience. We are dedicated to sustainable travel and are passionate about empowering local people. Our guarantee is that responsible travel has never felt so enjoyable and exciting. Who needs a tour guide when you can make your own way around Sri Lanka? Lanka Challenge was a fun-filling-10-day-trip with Amazing People from all over the world. LC is definitively one of the world's most adventurous activities. It's not only about winning the Challenge but also about helping the kind people of Sri Lanka. It offers you a chance to absorb the Lankan culture and eventually turn into one of them for a while. Believe me when I say that Large Minority's people will make you do things Lankan style. LM has done it this time and I am sure they will do it again... Two thumbs up for the good people at Large Minority and those who participated in the event in 2009.
Who else can claim they have circumnavigated Sri Lanka and Cambodia driving a Rickshaw? Or bought fuel in a coke bottle whilst wearing pyjamas? I truly believe there is no better way to see a complete country and get down with the local culture. You just can't do this on a tour. Make no mistake, this is a mentally and physically challenging adventure that will test you in many ways. The social side plays the biggest part - we made a great group of friends and every night was a party. Large Minority gave us an expertly planned fully-inclusive holiday which would be nearly impossible to organise on your own, all for a great price and still supporting local charities. Bring on the next location! People keep asking me about the Cambo Challenge and I think I've nailed what makes it so incomparable for me, it's all about the human interactions. The group were fun, switched on, non-competitive and from all over the map. The challenges got us past our barriers and into authentic Cambodian communities and interactions. The LM team were smart, creative, playful and good times. Traveling by tuk tuk was crazy, liberating and totally engaging with your surroundings, and Cambodia itself...half confronting, half embracing and incomparable throughout. We loved it. A guiding principle for Large Minority is recognizing the need to ensure the sustainability of our business and its impact on the environment and the communities in which we operate. We are committed to providing a rewarding work space as well as respecting the rights and interests of the community – being attentive to the environment and social impacts of its resources, products and services on others. In order to avoid our negative ecological impacts we aim to reduce any waste produced through the event. Participants are given a Go Green bag which they use to collect materials such as plastic bottles, cans etc We then collect this on a daily basis for recycling purposes. In Sri Lanka since 2009 we have organized an environmental campaign awareness at a local school where have now planted over 450 fruit trees. Students have been responsible for the trees and awards have been handed out to best performers. The number of trees planted is linked to the amount of carbon emissions which we need to offset for the event. To increase forested area and tree cover in the area. To increase the plant diversity in the agricultural lands. To reduce illegal encroachment, logging, uncontrolled extraction of fire wood, and hunting in the region through awareness programmes. To build local capacity to conservation of natural resource. To organize an environmental awareness campaign at the Wattegama School. As we understand the impact usually associated with tourism activities, we always respect the local people, their culture and the environment. We try to benefit local, small, independent businesses and encourage young talent. 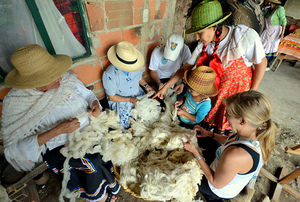 We source locally and support those who use natural materials and produce eco-friendly products. We think of the Challenges as the ideal opportunity to make a difference and bring positive change to every destination we visit. scale projects such as providing resources to local schools, aboriginal communities and local families. As well as larger projects such as the water pipeline in the Chambok community, which will benefit over 1,000 villagers. Our participants always get a chance to visit the projects, get involved and witness the impact and significance of their contributions whilst interacting with the local community. By sourcing locally we ensure that the destinations in which we operate benefit from our tourism activities. We normally support local partners which are small start-ups and sometimes family owned. We also encourage young talent and ensure that our wages are fair and higher than normal. On average we spend locally about USD 130,000 per event which benefits suppliers such as hotels, DMC's, restaurants, drivers, shops, etc. In addition to this we have already donated over USD 28,000 in Cambodia and Sri Lanka for different projects. Indirectly through our participants own fund-raising initiatives, the amount rises to USD 50,000. Sourcing locally from independent suppliers which use natural raw and or recycled materials. Using plates and cups made out of the “sheath” of Arecunut palm (Areca catechu) – beetle nut tree. No chemicals used when made. Using bags made out of jute, a vegetable fibre widely available and polypropylene, a material commonly recycled. Minimizing printed collateral and using recycled paper folders and envelopes (30% rice - 70% recycled paper). Collecting litter created throughout the event in order to minimize waste and hand over for recycling purposes. Supporting start-up and handicraft businesses and educating them on social/green practices. Encouraging participants to follow our green practices and devise their own initiatives throughout the Challenge. Hosting our websites through carbon neutral hosting companies. Supporting the local Government on their responsible travel initiatives. Is Large minority - Cultivating Travel Aficionados your company? Register to get access. You can get access to the Trips listed on TravelDragon, allowing you to add/edit your products. Register to get access if you'd like to add or edit Trips for Large minority - Cultivating Travel Aficionados.